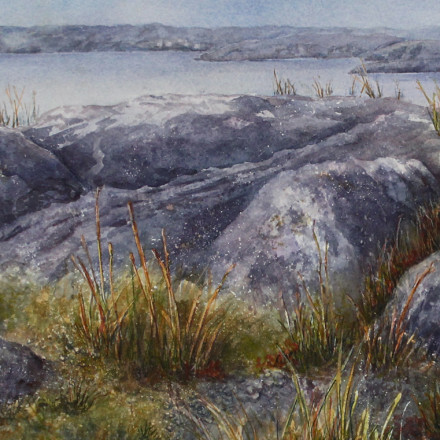 For those of you who subscribe to my newsletter you’ll know that I was in Ireland last year on an art vacation, where I had the opportunity to enjoy time with friends new and old, immerse myself in the exotic – yet familiar – nature of the country, and most importantly, gratefully avail of pleasant painting time and very instructive botanical workshops. Most of my painting time was at the National Botanic Garden in Glasnevin, Dublin, and in the beautiful gardens of Tourin House in Cappoquin, County Waterford. While 2016 was eventful, there was one event that followed me through the entire year, and that was the centennial of the battle at Beaumont-Hamel. This battle, which occurred on July 1, 1916, was a defining experience for not only the soldiers who fought and survived, but for the entire population of Newfoundland from that day forward. With over 700 men sent to fight, only 110 survived, with only 68 available for roll call the next day. This is the reason that, while the rest of the country celebrates Canada Day on July 1st, Newfoundland and Labrador also observes Memorial Day. When the year turned to 2016, the province of Newfoundland and Labrador turned to remembering those fallen soldiers at Beaumont-Hamel. 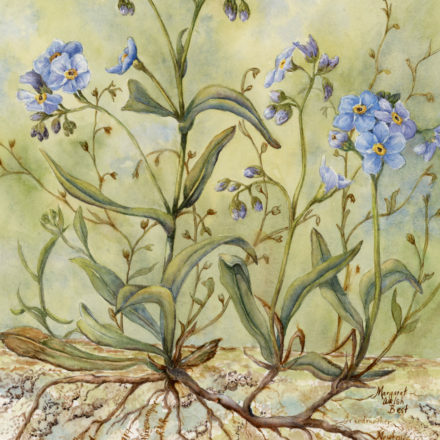 The flower chosen to represent remembrance of these deaths was, appropriately, the Forget-Me-Not. I currently have three (3) of my paintings selected for juried exhibitions both locally and internationally. Since 1952, the Province of Newfoundland and Labrador has celebrated excellence in the arts though the Arts and Letters Awards. This annual awards program affords a special opportunity for writers, musicians and visual artists – young and old, amateur and professional – to showcase their talents through a variety of media. The Rooms is pleased to present this year’s winners and works of merit selected by the adjudicators in the categories of visual art, literature and music. You can view all 35 visual arts pieces selected for this year’s Government of Newfoundland & Labrador Arts & Letters Awards Exhibit every day this week. My piece “Giant Step From Signal Hill to Cape Spear” was selected to show in the Society of Canadian Artists Online Exhibition this year. The painting in this exhibit is a landscape from Signal Hill, a fascinating landmark near my home in St. John’s, Newfoundland & Labrador. The Hill has a very colourful history and wonderful hiking trails, but what catches my attention is the amazing profusion of plants surviving in the crevasses of 500,000 year-old rocks. Here is a link to view my paintings as well as the other artists. The Society of Canadian Artists (SCA) was created in 1957 and is a national, non-profit artists’ organization dedicated to expanding the visibility and stature of the visual arts. SCA has representation in all of the visual arts media. We respect our historical roots, are aware of our current world, and are future-minded. 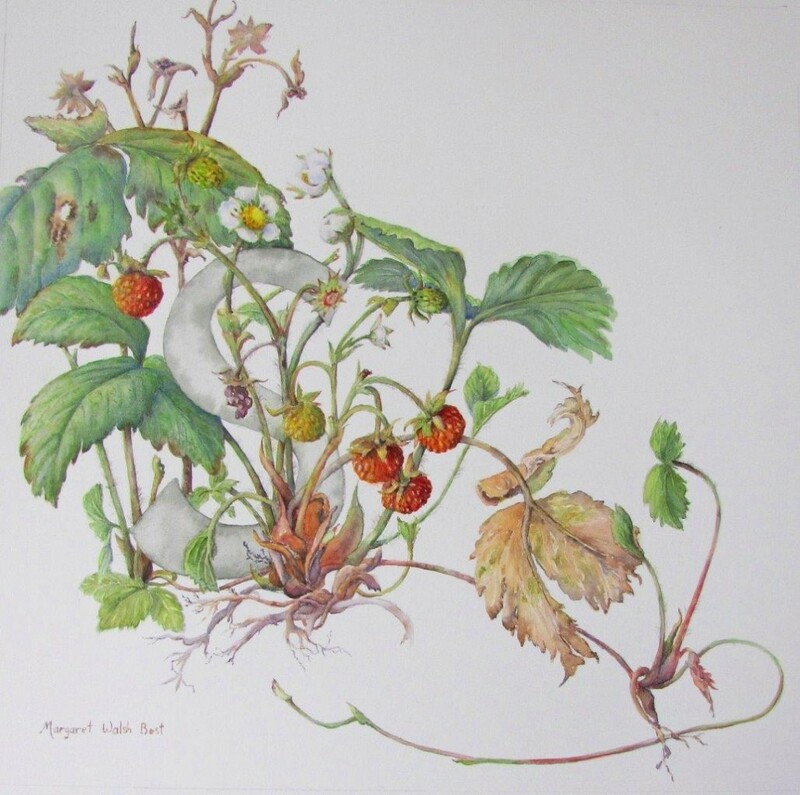 I have a piece entitled “Su talun fiain – Wild Strawberry” featured in The Hunt Museum in Limerick, Ireland. The opening will be on May 12, 2015 at 6:00pm and will close on June 28th. 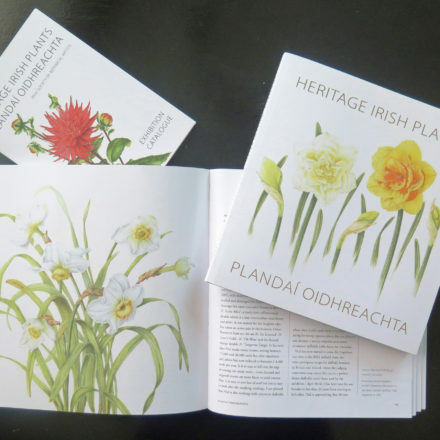 Following the successful showings of Aibítir: The Irish Alphabet in Botanical Art in Dublin, Derry and Belfast in 2014, Derry the exhibition continues during 2015 in a number of venues, including Bunclody Library Co. Wexford (March); The Hunt Museum, Limerick (12 May–28 June) and Christ Church Cathedral, Waterford (10 July – 21 August). If you have friends or family in either location, do let them know about these opportunities to see this wonderful exhibition. Exhibition News!!! Two of my paintings have been selected into current juried exhibitions. One is at The Rooms Provincial Gallery, St. John’s, Newfoundland & Labrador. ( http://www.therooms.ca/artgallery/ ) It is open from April 28 – May 17, except Mondays. Check it out with the 34 other visual arts pieces selected for this year’s Government of NL Arts & Letters Awards Exhibit.